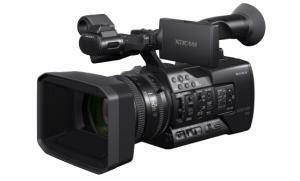 The PXW-X180 three 1/3-inch type Exmor™ CMOS sensors camcorder records Full HD XAVC Intra and XAVC Long GOP, as well as MPEG HD 422 50 Mbps, MPEG HD 420 35 Mbps, AVCHD and DV, making it ideal for a wide range of applications from education/videography to news and broadcast production. As the successor to the HVR-Z7 and HXR-NX5, the PXW-X180 has a lot of attractive features, including dual SxS memory card slots, proxy recording on SD card, a G Series fixed 25x HD zoom lens with 26mm wide angle and variable ND filter, that provides four conventional mechanical 4 ND filter positions or a linear switch dial for more control in changing light conditions. The camcorder also has wireless functions and NFC (Near Field Communication) capabilities.